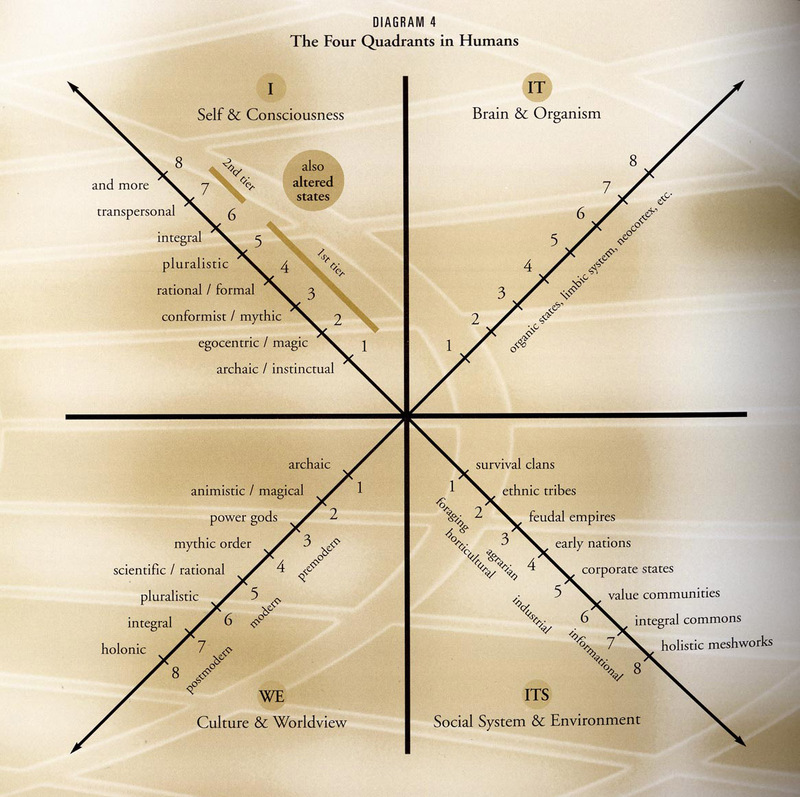 This page contains a variety of images and graphics that have been used to illustrate various aspects of the four quadrant model and some of the many ways it has been applied. It begins with one that was used on the home page of the previous Foresight International website. In the upper left we’ve used a piece of provocative street art that directly critiques the advertising industry. It likens the human mind to a ‘battlefield’ where we see a range of symbolic struggles taking place. The ‘three monkey’ sculpture added there refers to some of the ways that we remain passive, choosing to ignore aspects of reality that we find threatening, i.e. ‘speak no evil, see no evil, hear no evil.’ Resources that illustrate this area include one by Hines and Bishop called Thinking About the Future; another, by Ken Wilber is Integral Psychology. Such works provide two of many ways of understanding the interior complexity and dynamism of the often-overlooked human interiors. Such work has many applications. For example we can begin to see alternatives to common strategies – such as avoidance, denial and repression – that are often employed to soften the psychological impacts of the coming global emergency. The upper right quadrant deals with what people actually do – their actions, performance and achievements. We’ve illustrated this domain with an image of a female acrobat during mid-routine high above an admiring audience. The insert is of an ancient marble panel from the Acropolis in Athens depicting a contest between man and centaur. The image is ambiguous because, on the one hand, it illustrates a peak of cultural achievement in Greece. On the other, it depicts themes of continuing conflict that remain all-too-evident today. Two sources that can help to illustrate this quadrant are Clive Hamilton’s perceptive Requiem for a Species and Richard Hames’ The Five Literacies of Global Leadership. Both deal with possibilities for human action in the current context. The lower left quadrant is represented by part of a fresco painted by Raphael in the Vatican, Rome. It shows a group of classical philosophers debating and contending within a glorified version of St Peter’s Basilica. It is a powerful image of cultural authority. The sculpted head of a Greek god has also been included to indicate how earlier societies produced these entities as part of the authority structure of their times. Such cultural foundations affect our present world in countless, often invisible ways, not least through language and religion. Two works that could represent this quadrant are Luckmann & Berger’s classic account of The Social Construction of Reality and more recently, Saviano’s powerful work Gomorra. The latter details some of the human and cultural costs that have occurred from generations of Mafia influence in southern Italy. Cultures may appear amorphous and elusive but, at the same time, they are very powerful. The lower right quadrant image is perhaps the most obvious and straightforward. 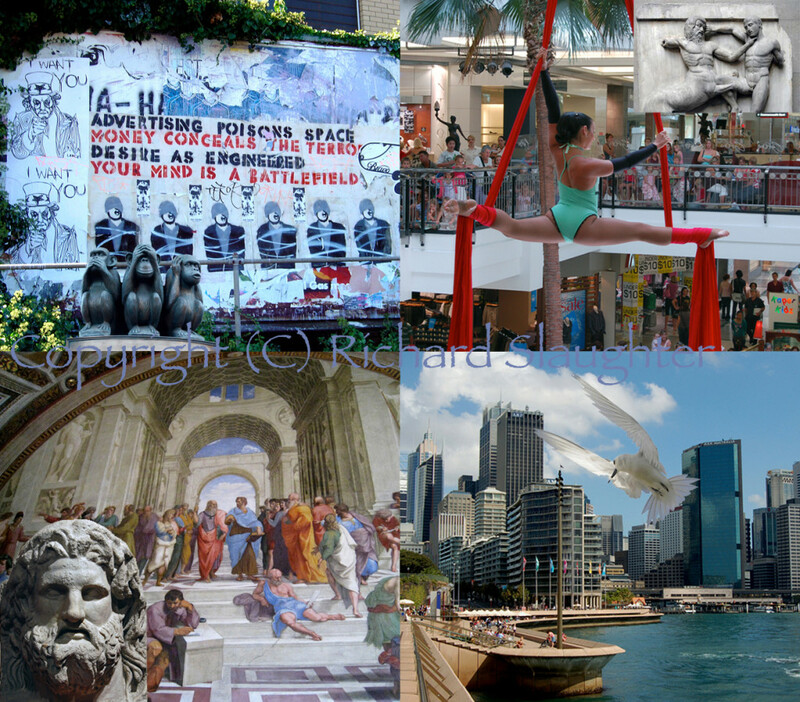 It is represented by n image of Circular Quay in Sydney. It depicts the line between the natural world (represented by the blue sea and sky) and the human infrastructure that seems to dominate both. To heighten the contrast, a white tern from Lord Howe Island is hovering over the water and seems to be looking back at the newly emergent human world. Two works that may illustrate this view are Wilson’s The Future of Life and the Meadows’ Limits to Growth – the 30 Year Update. Works of this kind that deal with the great global systems are crucial for appreciating the current imbalances between the human and the natural worlds. 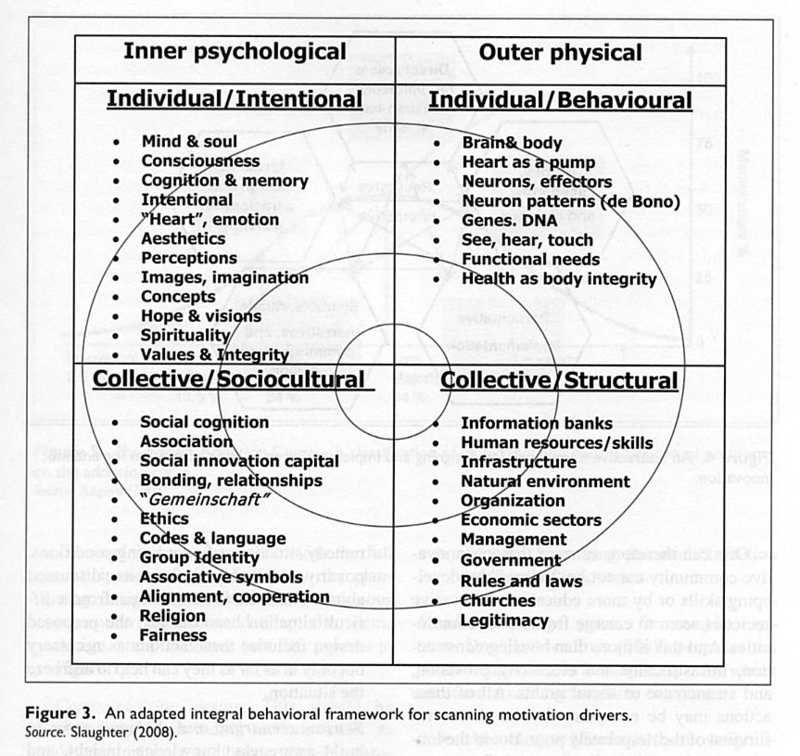 Prof. Philip Spies from Stellenbosch University in South Africa adapted a standard model of the four quadrants to illustrate a ‘Behavioural Framework for Scanning Motivation Drivers’ as follows. Here is an overhead slide from a workshop I ran. 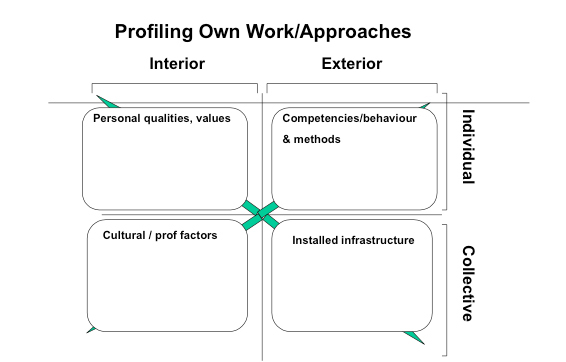 It used the four quadrant model as part of a reflective process of self-diagnosis. This uncomplicated figure depicts the four quadrants within humans. 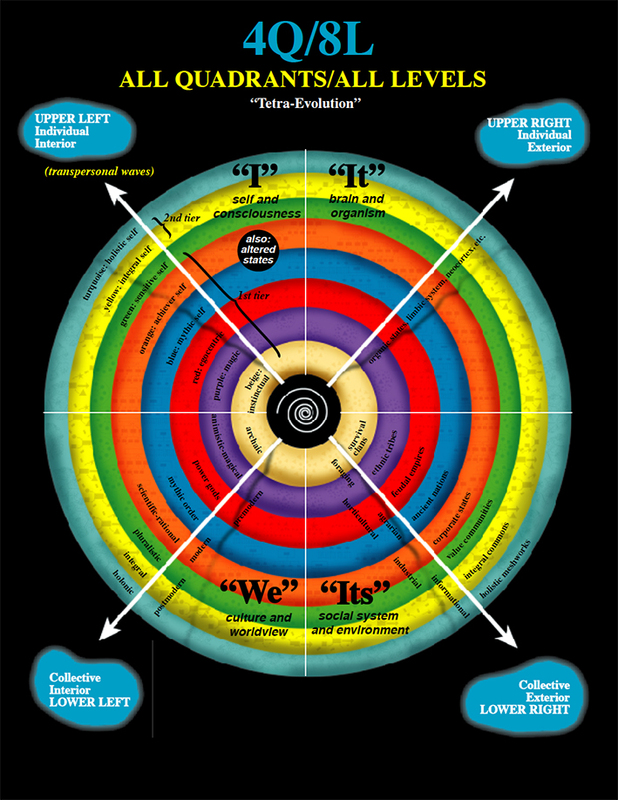 Beginning with the UL quadrant it includes Self and Consciousness, Brain and Organism, Culture and Worldview and, finally, Social System and Environment. Here is a very different model that seeks to integrate an integral perspective with spiral dynamics. The latter considers how different kinds and levels of human operating systems (represented by the colours such as those used here) activate certain values and their associated world views. See the discussion of spiral dynamics integral (or SDI) with its co-originator Don Beck in the Videos section on this site. Also the one-page graphic summary by Jan Lee Martin here.